Description: thirty SUPER games for you, dog, and friends! Synopsis: This book is designed to give clubs and individuals ideas for running fun events at the end of shows, for fairs, and just local fun days. Thirty games are provided and most are supplemented with variations allowing hundreds of games to be actually developed from this book. 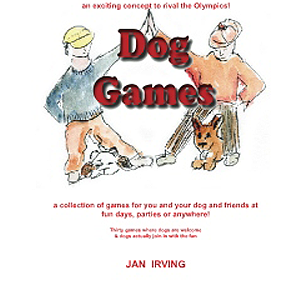 The games are for all age handlers, and all dogs. Some commonsense will be required to sort the athletic from the toddlers, but in many games such a division isnt even necessary. Each game is categorized by activity level, indoor or outdoor, teams or partnerships, whether it would be a good game to start the evening off with – ice breakers, and the equipment required. A great deal of emphasis has been placed on providing games that require absolutely no equipment or a positive minimal amount. It is difficult enough getting groups together without the hassles of having to take equipment too! High activity level will probably see the sweat raised, low activity level will generally involve no more than sitting around.Teams are made up of a number of partnerships. Partnerships are the joined entity of handler and dog. The dog should be involved in all these games and variations. Incorporating your dog will allow a rapport to develop between you and him and also help socialize him into the world of humans and dogs.